MixPanel is a real-time analytics tool that helps companies understand how users interact with web applications. It allows you to track not only page views, but the actions users take while using your application across sessions, platforms, and devices. Mixpanel’s free and startup plans have set data history limits. If you're on their free plan, any time ranges and comparison periods you set must be equal to, or less than, 60 days. For startup plan customers, this is set to 12 months. Which metrics and visualizations are available for Mixpanel? Visualises completion rate over time for events as a bar chart, with optional goal line. Display a count for multiple events in a period with optional comparison period. Display a list of the top properties for an event. Display a bar chart of events with a property. Display revenue for all or a specific property in a period with optional comparison period. 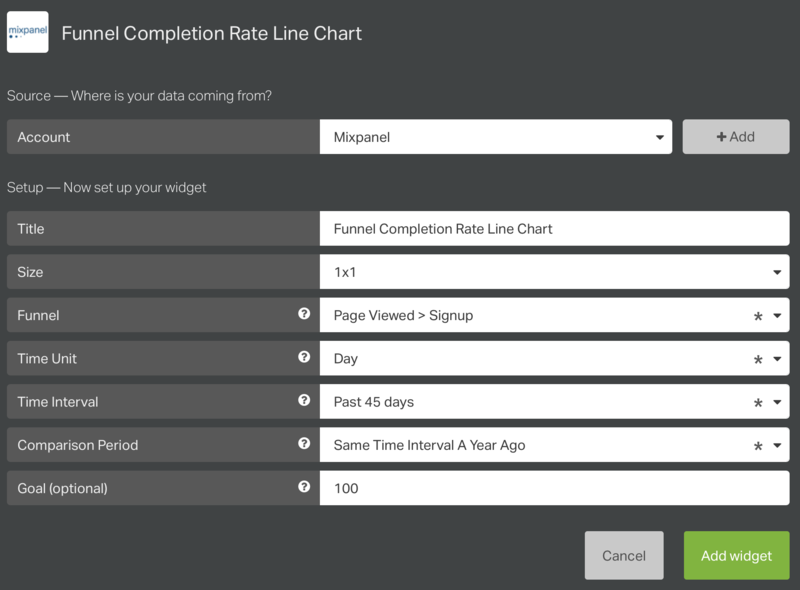 Display the completion rate of a funnel. Visualises the completion rate of a funnel over time as a line chart. Display a line chart of revenue data over time. Visualises event count over time as a line chart. We use the event names as unique identifiers for Mixpanel events. This means that if multiple events have the same name, they'll only be fetched once. Search for Mixpanel using the Search sources field. Alternatively, you can also scroll down the alphabetical list of integrations until you reach the Mixpanel integration. Click on the Mixpanel integration. Is this is your first Mixpanel widget? 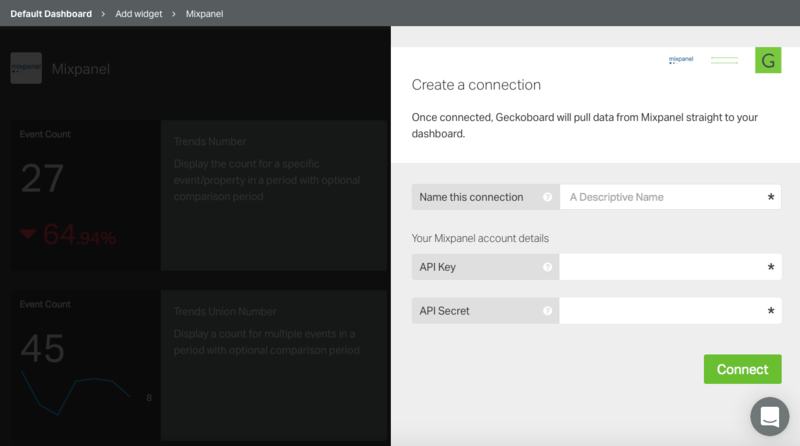 You'll need to connect your Mixpanel account to Geckoboard. If not, you can skip to our example Mixpanel widgets. When adding your first Mixpanel widget, you'll be asked to create a connection and authenticate your Mixpanel account so that we're able to collect your data and display it on the dashboard. You only need to create this connection once – we'll take care of the rest. The authentication box will ask you to Name this connection. This will help you distinguish between multiple connections. You'll then need to enter your API key and Secret. These are required by Geckoboard to access your Mixpanel project. In your Mixpanel account, click on Account, then Projects to locate them. Make sure you use the API key from Accounts, rather than the Token from your individual Project settings. You're now ready to configure your first Mixpanel widget! Any Mixpanel widgets you create will pull in and display data from this Mixpanel account. You can connect as many Mixpanel accounts as you need, but you'll only need to authenticate once per account. 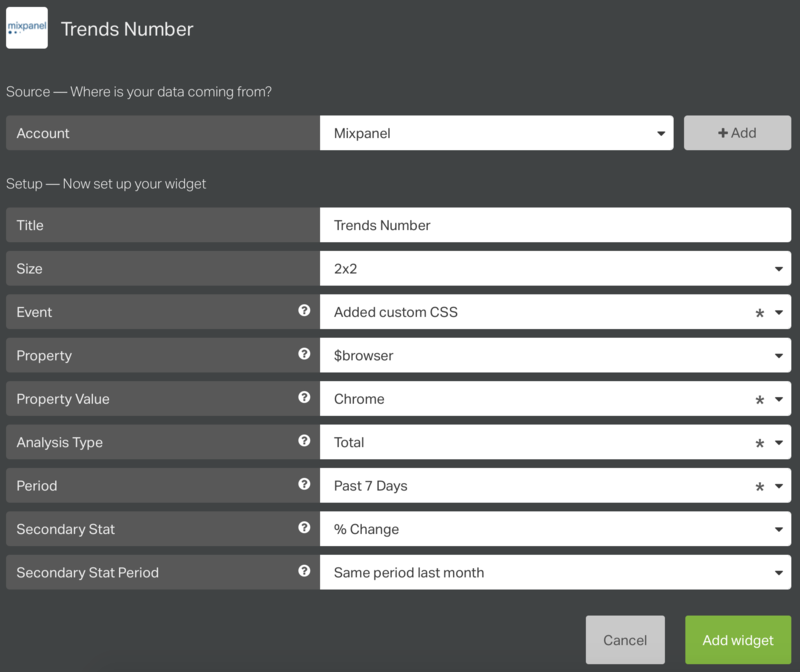 The Trends Number widget displays the count for a specific event or property in a specific period with optional comparison period. We can use the Trends Number widget to show the number of people who have added Custom CSS to their dashboards using Chrome during the last 7 days, and compare it to the same period last month. The Funnel Completion Rate Line Chart widget helps us visualize the completion rate of a funnel over time as a Line Chart. We can use the Funnel Completion Rate Line Chart widget to visualize the number of customers who are completing the funnel 'Adding Widgets' in the last 45 days, and compare this to last year's same time interval. The goal is to have 100 customers per day completing the funnel. The shaded area represents our goal of 100 customers that have completed the funnel. The Revenue Number widget displays the revenue for all or a specific event or property in a specific period with optional comparison period. 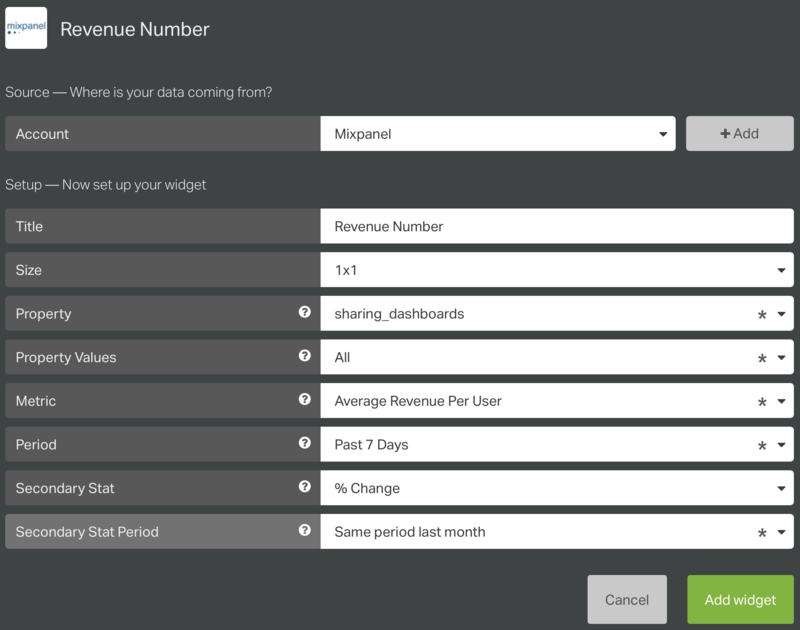 We can use the Revenue Number widget to see the average revenue for each user that has shared dashboards within the last 7 days. We'll use the secondary stat feature to compare it with the revenue generated in the same period last month.